After taking the reins as President of the Brooklyn Dodgers on October 26, 1950, Walter O’Malley’s first year at the helm proved to be a memorable one on the field, as well. O’Malley had changed managers after the 1950 season signing Charlie Dressen to a one-year pact to replace Burt Shotton. The Dodgers held a 13 1/2-game lead in the National League on Aug. 11, before the New York Giants put on a late-season charge to whittle away at the margin. The Giants’ key move to stay in the race was calling up 20-year-old Willie Mays in May, as he had hit .477 in 35 games for Minneapolis (Triple-A). 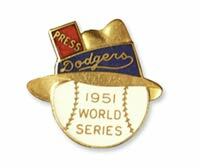 Tied with 95 wins apiece on Sept. 30, the Dodgers played at Philadelphia, while the Giants played the Boston Braves. While the Dodgers fell behind Philadelphia 6-1 after the third inning and 8-5 after five innings, they rebounded to tie the score with a three-run eighth inning. By the sixth inning, the Dodgers learned that the Giants beat the Braves, 3-2, so a must-win situation developed or their season was over. Still tied after nine innings, the game pushed into extra innings, with both Managers Eddie Sawyer and Dressen pulling out all the stops. Sawyer used Robin Roberts in relief, while Dressen brought in Don Newcombe, who had shut out the Phillies, 5-0, to win his 20th game of the season. Second baseman Jackie Robinson kept the Dodgers’ hopes alive by making a game-saving diving catch in the bottom of the 12th inning. With the bases loaded, Eddie Waitkus of the Phillies hit a soft liner to Robinson’s right. Robinson dove for the ball, backhanded it and had the wind knocked out of him for a couple of moments. That night, O’Malley praised Robinson’s extraordinary efforts and spectacular catch. In the 13th inning, a tiring Newcombe was relieved by Bud Podbielan. After securing the first two outs in the top of the 14th inning, Roberts faced Robinson and worked him to a 1-1 count. On the next pitch, Robinson was the hero once again as he crushed it into the left field stands and the Dodgers prevailed, 9-8, in 14 innings. The Dodgers again were tied with the Giants and forced a three-game N.L. Playoff Series. 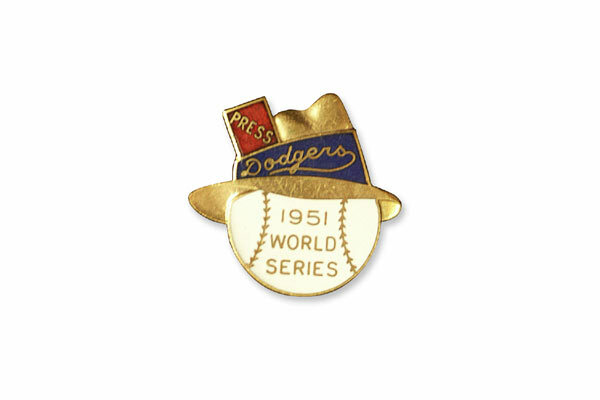 The Dodgers lost in Ebbets Field, 3-1 in the first game, while they blanked the Giants, 10-0 in the second game at the Polo Grounds behind Clem Labine. With the teams tied at a game apiece, the Giants hosted the Dodgers for the third and final playoff game at the Polo Grounds on Oct. 3. 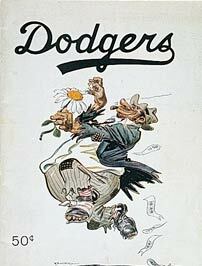 Typical of the rivalry which had begun between those two teams, even before they became National League teams in 1890, the Dodgers held onto a 4-1 lead going into the bottom of the ninth. As fate would have it, the Giants got two runners on (singles by Alvin Dark and Don Mueller) and Whitey Lockman doubled in a run to cut the lead to 4-2 with one out off big Newcombe, who had been a workhorse for the Dodgers that week. Manager Dressen decided to lift Newcombe as Bobby Thomson was coming to the plate. Dressen opted for pitcher Ralph Branca, instead of Carl Erskine, who was also warming up in the bullpen and Thomson drove a dramatic three-run home run into the left field seats. The famous “Shot Heard ‘Round the World” broke the hearts of Dodger fans everywhere, as they lost to the Giants, 5-4 and with it the N.L. Pennant. 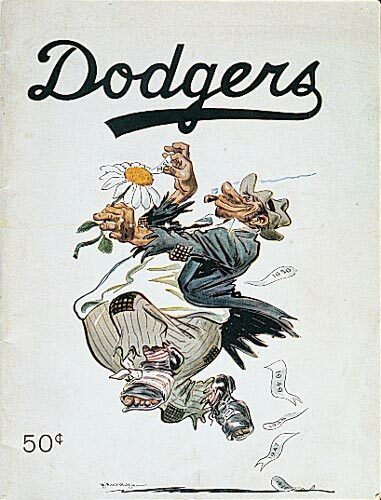 Click image for a larger view1951 Dodger YearbookCopyright © Los Angeles Dodgers, Inc.
Click image for a larger view1951 DodgersCopyright © Los Angeles Dodgers, Inc.